People living with mental health and/or addiction issues increasingly have the option of receiving support from someone who has been through similar experiences. New Wilfrid Laurier University research, the Peer support Outcomes at Work Research (POWeR) project, will examine the effectiveness of peer support on occupational recovery for people with mental health and addictions challenges in the workplace. The project received $168,000 in funding from the Workplace Safety and Insurance Board’s (WSIB’s) grants program – the largest grant Laurier has ever received from the organization – and is being conducted in partnership with seven peer support organizations in Ontario and an advisory committee composed of peer support stakeholders and scientific experts. The basic premise of peer support is that someone who has lived experience of a mental health or addiction issue and is managing recovery well is uniquely positioned to help someone else through a similar issue. Although successful volunteer-based programs exist, many peer support workers are now trained and paid for their work. Workplace-focused peer support programs vary widely. Some focus on workers within one industry while others rely on clinical or community organizations that help people from a variety of occupations. Sometimes peer support is the main form of intervention; sometimes it complements other supports. Peer support can be provided one-on-one or in a small-group setting. Regardless of format, peer support can relieve pressure on the health-care system. “But even beyond the economic savings, peer support has great potential to promote hope, empowerment and more of the personal aspects of recovery,” says Coulombe. Coulombe has researched peer support programs more generally, but says research focused on occupational outcomes has been limited to date, even though peer support is increasingly being integrated into workplace wellness programs. Through the POWeR project, Coulombe, Hardy and co-investigator Sophie Meunier of Université du Québec à Montréal aim to recruit 300 participants who are just beginning peer support programs. They will assess their well-being before they begin the program, 12 weeks later, when most programs are concluding, and another 12 weeks after that. The researchers will compare how peer support participants fare on measures such as how long their leaves are and their wages upon return to work compared to demographically similar people who have been receiving WSIB benefits for mental-health leaves but have not participated in peer support programs. The researchers also plan to provide fact sheets for employers, a policy brief and videos in which people who have received or offered peer support share their experiences. As the project coordinator, Hardy, who is in the second year of the community psychology master’s program, has played a major part in putting together the research proposal, developing survey questions, spearheading ethics approval, liaising with community partners and coordinating logistics. As the project moves forward, Hardy will oversee and support the work of the three or four graduate students who will be hired as interviewers and a number of undergraduate students who will be hired to help recruit participants and clean the data. In addition to undertaking the bulk of the work, the students will receive valuable research and statistical training. Hardy is also involved with the Thriving on Campus study focusing on LGBTQ+ students and the Laurier Centre for Community Research, Learning and Action’s Flourishing Communities Research Group, in addition to a part-time role as a policy analyst for the Public Health Agency of Canada, which arose from a summer position in Ottawa. 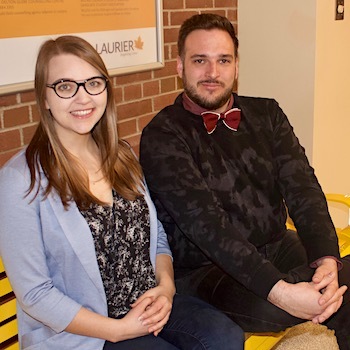 Recently, she won the participants’ choice award in the Three Minute Thesis competition at Laurier. Hardy plans to stay involved in the two-year project in a reduced capacity even once she finishes her studies in August and lands a full-time job.